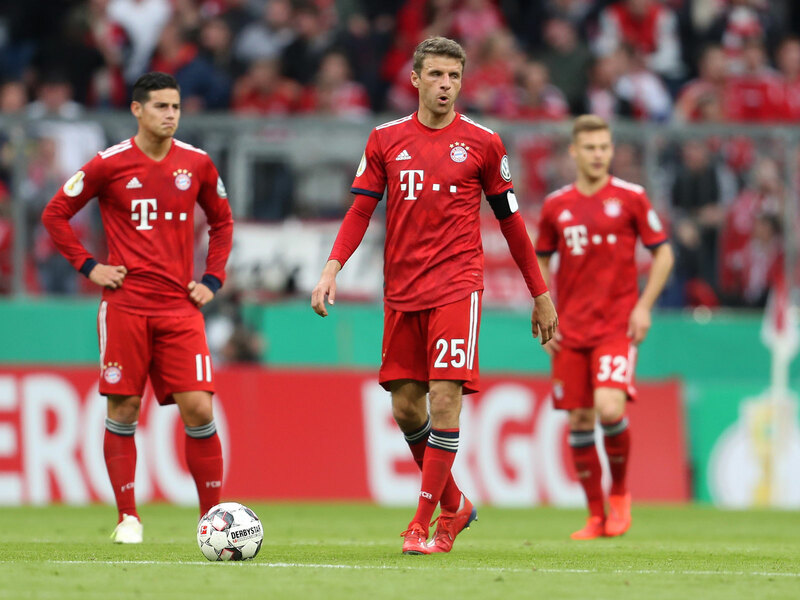 What does it say about the Bundesliga–and the economic model prevalent across European soccer–that Bayern Munich could still win the league in a season where, by its own standards, it's been beyond subpar? If not now, then when? Borussia Dortmund travels to Munich to face Bayern on Saturday, the 100th Bundesliga meeting between the sides, with a two-point lead in the table. Win, and with just six games remaining after that, the title should be theirs. Lose, and the sense would be that momentum has shifted decisively toward Bayern. This has been an enthralling title race. In mid-December, Dortmund was nine points clear, but since then Bayern has clawed its way back. It had pulled level before last Saturday’s draw at Freiburg. In that sense, this is the most important Klassiker–as it is being marketed on the model of the Barcelona-Real Madrid Clasico, although Der Klassiker used to be between Bayern and Borussia Monchengladbach–since February 2011, when Dortmund went away to Bayern and effectively sealed Jurgen Klopp’s first league title with its first win in Munich in two decades. Not too far beyond the excitement, though, there is a doubt. What if Bayern wins? And that matters, not just for the two sides involved, but for the Bundesliga as a whole. Although its league form has picked up recently, Bayern has, by its own standards, been terrible this season. The squad has almost visibly aged–Arjen Robben, Franck Ribery and Rafinha are on their last legs–while many other senior players have looked stale. Manuel Neuer hasn’t ever really recovered his form after last season’s injury problems; Mats Hummels and Jerome Boateng have struggled; David Alaba has looked exhausted, drained of confidence; Thiago Alcantara and James Rodriguez seem to be undergoing a crisis of confidence; Thomas Muller is locked in a three-year run of poor form; and Robert Lewandowski is playing like a man who knows that, at 30, his chance of a really lucrative move to Real Madrid has slipped through his grasp. There was a run of nine league games in the autumn when it failed to keep a clean sheet. Generally, there has been a lack of cohesion. Against Liverpool in the Champions League, although Bayern managed a 0-0 draw at Anfield by packing men behind the ball, it was desperately exposed when forced to come out and play at the Allianz Arena. Without playing especially well itself, Liverpool looked quicker, sharper, stronger and more imaginative. In the second leg, it was almost as though Liverpool couldn’t quite believe how little Bayern had to offer and started off tentatively because it feared this was some tactical ruse to lure it forward. If Bayern, at its lowest ebb for almost a decade, still wins the league, what does that say about its competition? Bayern has already won six league titles in a row. The Bundesliga’s apologists will point out that there have been more different Bundesliga champions than Premier League champions since the Premier League came into being in 1992, but in the past decade there have only been two, and they’re the two competing for the title this season. There is a monstrous structural imbalance in the league. According to the latest Deloitte report, Bayern’s income by revenue for 2017-18 was €629.2 million. Dortmund’s was only a little over half that at €317.2 million, with the rest some distance behind that. Bayern have been ruthless in stripping Dortmund of its best assets, signing Mario Gotze, Lewandowski and Hummels in a four-year period. It’s been the case for a long time that for anybody else really to have a chance of winning the title, Bayern had to have a bad season. The worry now is that even that is not enough anymore. Bayern is already building for next season. Benjamin Pavard and Lucas Hernandez, France’s two World Cup-winning fullbacks, have already been signed on ahead of their summer arrivals. There will be significant changes higher up the pitch, too, with Ribery and Robben set to leave. New signings don’t always settle, but it’s hard to believe Bayern will not be stronger next season. What would be best for 19-year-old breakout star Jadon Sancho: a return to England or a longer stay in the Bundesliga? @warrenbarton2 joins Planet Fútbol TV to discuss the Dortmund sensation. And that is a warning. It’s a warning to Dortmund not to lose this game, because another chance may not be coming along soon (and it's probably best to get the likes of Jadon Sancho, Dan-Axel Zagadou and Jacob Bruun Larsen locked down on long contracts, or at least make sure they’re sold abroad and not to Bayern). But it’s also a warning to the Bundesliga and beyond. The present economic structure, under which Bayern could still win the league after a desperate season, is a farce.